The kit has many features which improve performance, safety and durability and make for a more versatile system. 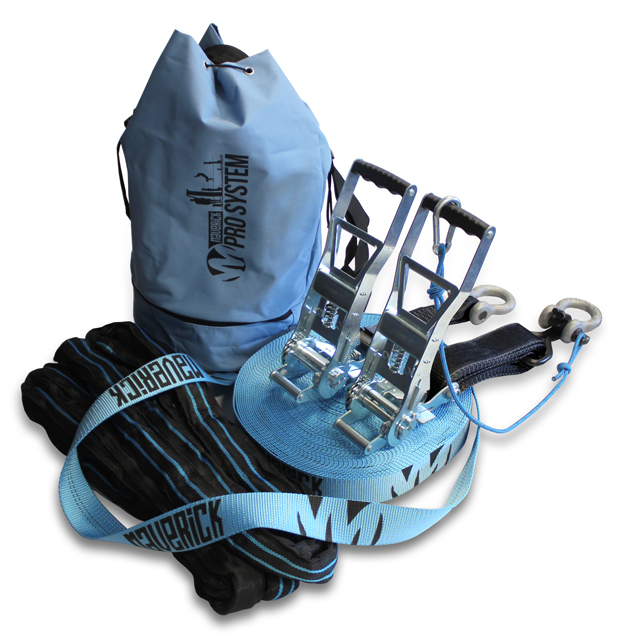 Whilst this kit is perfect for more advanced users and serious trickliners, it is also a great, user-friendly choice for anyone wanting to invest in a high-quality slackline kit. Webbing – Our new pro-system webbing has a great dynamic feel. It has more stretch and more power, meaning that you can get effortless air on dynamic tricks without such high impact forces being exerted on your body. At 32M long it is one of the longest kits available and the extra length makes it great for all sorts of situations – rigging waterlines, surfing, etc, and also gives the all-rounder a taste of longlining as you can easily rig 100ft lines, varying the tension to increase difficulty. Hardware – The kit comes with 2.5M long, 2T spansets and 3.25T Bow shackles to connect to trees, this is much safer and more versatile than the traditional ‘choke’ method and will greatly increase the lifespan of the gear. 2 long-handled Ratchets provide all the power you need without over-filling the spool. Safe-Release-System – Strong, safe and easy to use, our ‘Safe-Release-System takes the stress out of releasing the line, making de-tensioning a more pleasurable experience. This system allows smooth, controlled release. Safer, easier to use and much kinder to you and your webbing. I would like to inquire about the Slackline out that the price of Brazil, Real …?? Thanks for getting in touch Thiago. Have just bought this line & tree pro from an online retailer. The line exceeded my expectations. A real pleasure to walk on, easy to set up. Much nicer than the previous line I’ve been using (Gibbon Classic 15m). That’s because there’s a really nice “bounce” in the line when tensioned. The line is nice and soft on the feet. I’ve been slackining a couple of months now & have this set between two trees 18 metres apart. Can’t wait to try it at a longer length ! The essential components (line, ratchets, shackles, slings) are high quality. However, the bag is flimsy and I don’t suspect it will last that long & the tree pro (bought separately) is similarly flimsy and should come free with the kit or be cheaper. 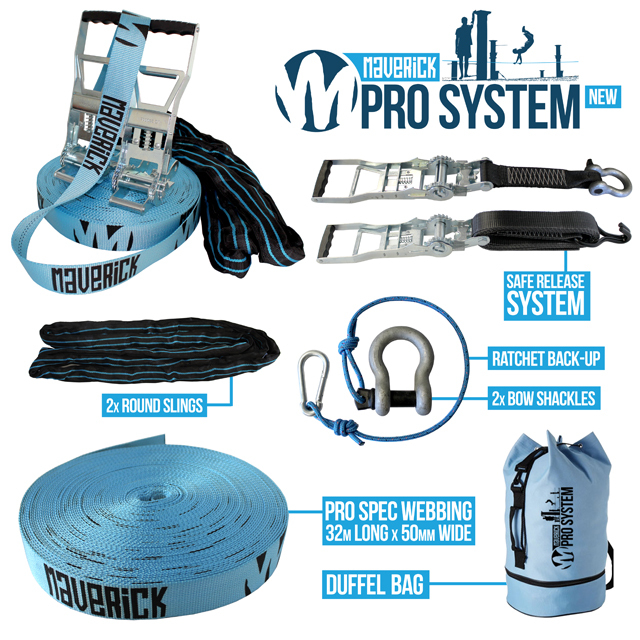 I’m from Brazil and I would have a slackline Maverick PRO-system 32 meters of the blue, as would leave Real in Brazil and the pay rate in Brazil and tax.